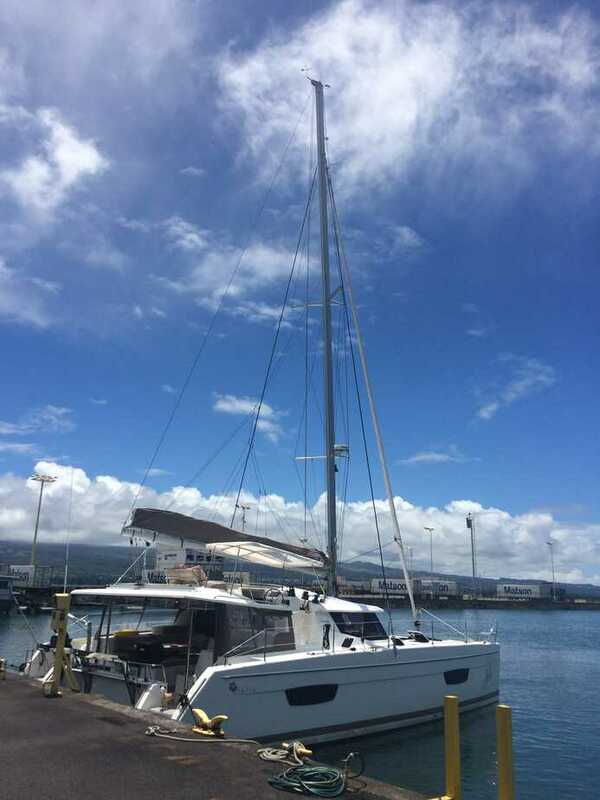 After 15 days at sea (actually 15.16…) S/V Julia arrived in Hilo, Hawaii. When we departed Oakland and headed out in San Francisco Bay, a thick fog hung over the Golden Gate Bridge. The fog was selective, above us and behind was clear blue sky, but the fog sat surrounding the bridge – just the peaks of the suspension structures barely showed over the bank of fog. I’m glad we got such great weather and pictures while we came in to SF. I was on watch as we passed under the bridge going out, and I called out the announcement: “we are right under the bridge!” We looked up to see nothing but fog, and were chased out of the bay by the sound of the fog horns. We kept straight out west, into the wind and waves to get out from the lee of the shore. The route planning for this trip was a careful threading of the needle – if we went too far west, winds would be too strong, but if we stayed too far east, the winds would be too light. We kept a lookout for whale spouts, and at one point even had a group of three whales swim right up close to us. 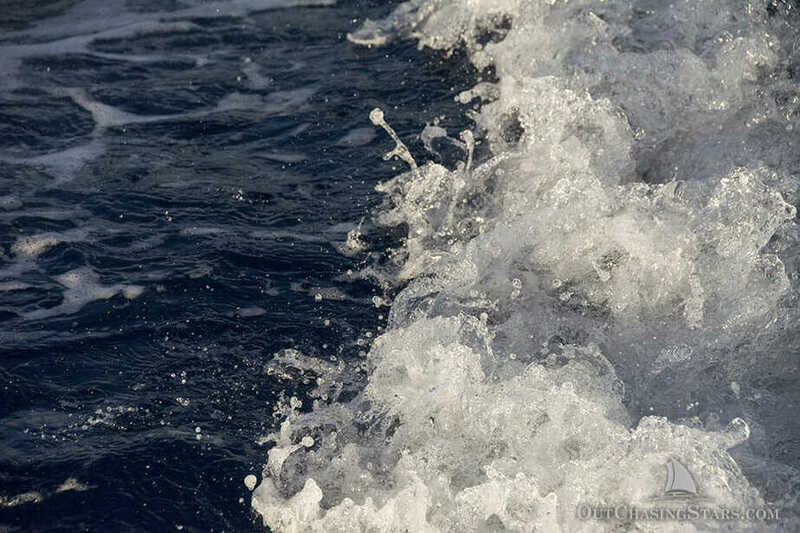 150 miles offshore, a sea lion’s fin waved to us as we passed by. Julia has tons of fishing gear onboard. Tom went overboard on the shopping spree, with lures I doubt he will ever use as they are too big, too much drag. 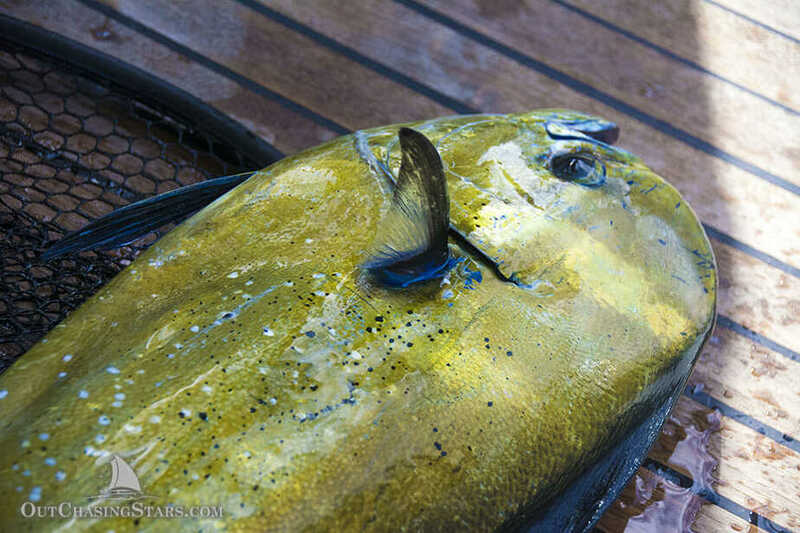 However, I can’t complain too much because in a matter of days, we’ve landed five mahi mahi. Four were small, two-feet long females, but one was a 36-inch bull. I showed Tom how to fillet the fish, and they’ve still got two in the freezer. We’ve had mahi mahi five ways: sautéed with butter, lemon and dill; ceviche; fish dip; steaks with a cumin seafood rub; and curried. The last week or so was extreme downwind sailing. We’ve mostly been wing on wing. 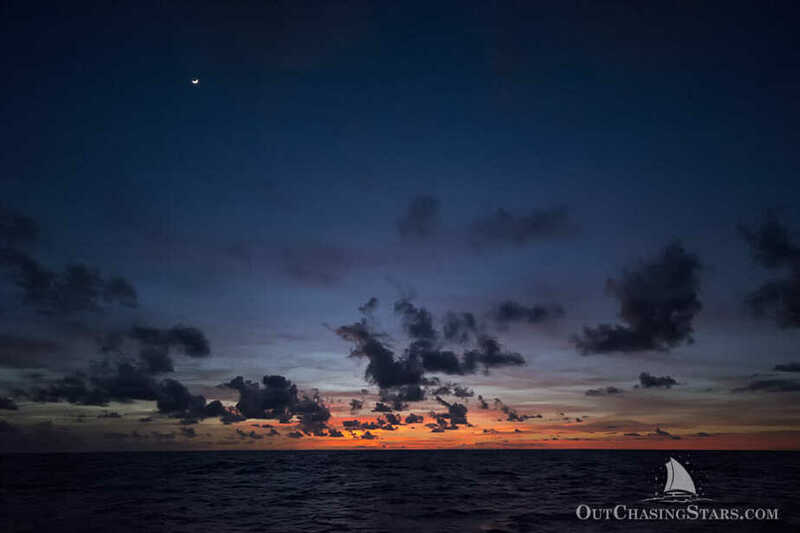 We were trying to sail as fast as possible early in the week, and then as direct as possible later in the week. As is usually the case on long passages, after the first few days, everyone is up and enjoying the afternoon. I’ve cooked dinner every night, some times with appetizers, sometimes with just cheese and crackers. I’ve been very pleased with how everything I’ve made has come out, and I think Susan and Tom are too. “I think I said this last night too, but this is my favorite meal you’ve made for us!” Tom said, as I served an Asian chicken with vegetables and peanut sauce. Even the mahi mahi came out well, surprising since I’ve only cooked it a few times on Starry Horizons and it never came out that well. 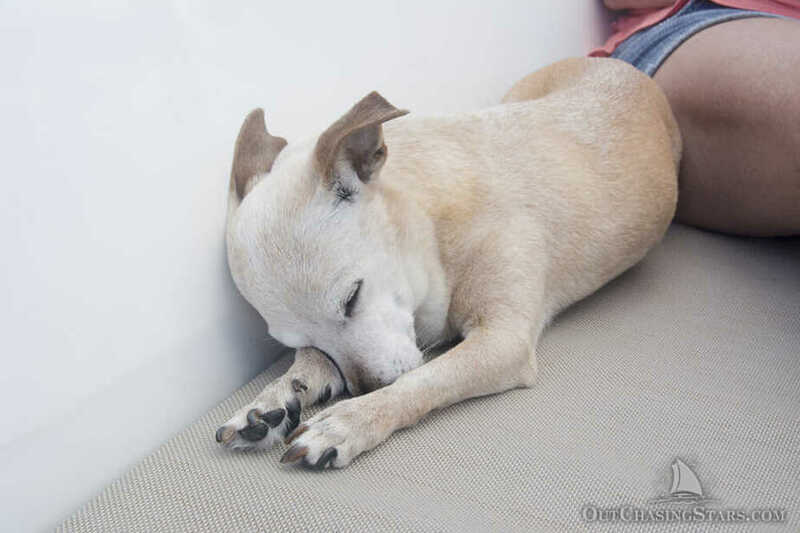 It’s amazing that we lived onboard Julia for 35 days. We’ve had flat mates for 35 days. Everyone has got on well, as expected there are little things that they do differently from us, but we defer to them; after all, it’s their boat. We’ve continued more sailing lessons. There have been some moments where a gap in Susan & Tom’s knowledge has surprised us. Small errors have been made, the kind frequently made by one who is not 100% confident in the workings of the lines. There was frustration for all parties involved, but there was no yelling or fighting, so that’s good. I’m confident that we’ve taught them a lot, and Susan and Tom were pretty lucky – they got a very good rate for us. Susan told us what other people quoted and we were WAY cheaper. We had a bet going about when we would get cell phone signal – I won! 12 miles out. That meant I had to get busy making our plans. We’ve got a week to run around Hawaii before we fly back to Tonga. Flights were tricky. Unless we wanted to route to Sydney or Auckland, which adds 20 hours to our travel time, we needed to layover in Fiji. There’s only one flight a week non-stop from Honolulu to Fiji. Then, we had to decide if we wanted to fly the Nuku’alofa or direct to Vav’u. The flight into Nuku’alofa from Fiji doesn’t arrive in time to catch the domestic flight to Vava’u, necessitating an overnight in Nuku’alofa. But the flight from Fiji to Vava’u is only twice a week….necessitating an overnight in Fiji. Ugh. Top it all off with crossing the date line and it gets REALLY confusing. We docked in Radio Bay in Hilo. Hawaii has a reputation for not being very cruiser friendly and Radio Bay is a prime example. There’s a wharf to tie med moor style, but no road access. The wharf is big, the cleats are big and spaced out. 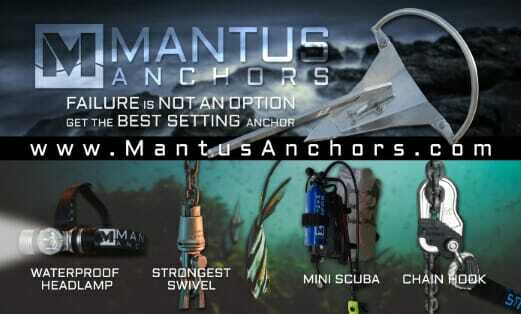 It’s not designed for the cruising boat. Susan and Tom went ashore for a walk while David and I packed up all our stuff. We grabbed an Uber and said goodbye to Julia. Tom and Susan graciously took us out to a celebratory dinner in Hilo last night, where we said our goodbyes! 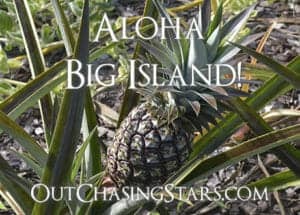 Now our plan is to spend 3 days seeing the sights on the island of Hawaii (the Big Island) before heading to Oahu for a few days and then flying out. One of our many glorious sunsets at sea. See the moon? 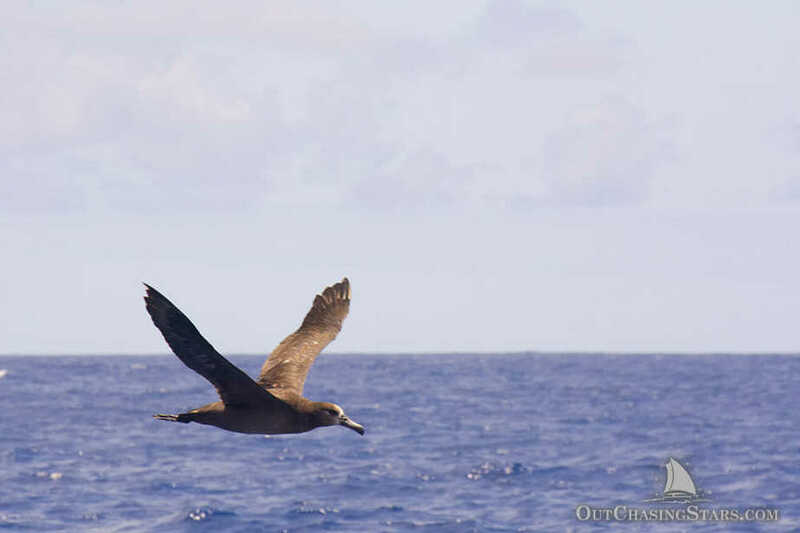 We saw large black-footed Albatrosses, often in pairs, living out in the middle of the ocean. 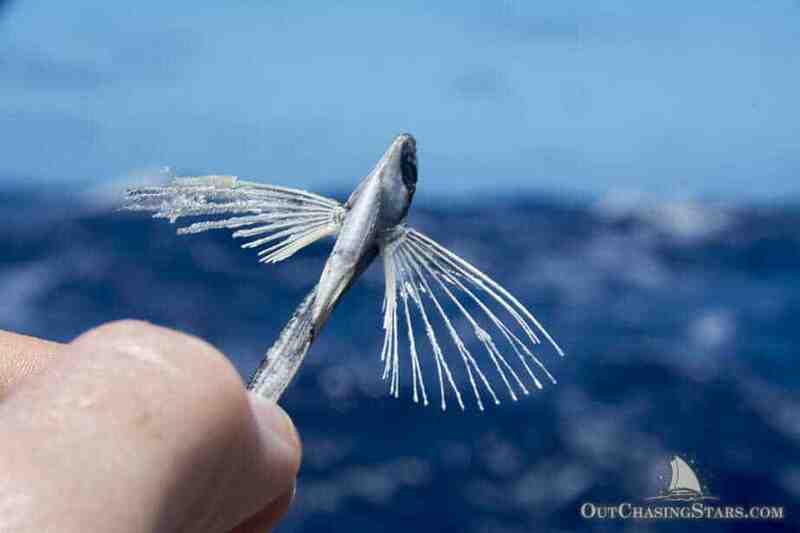 A tiny flying fish we found washed up on deck. 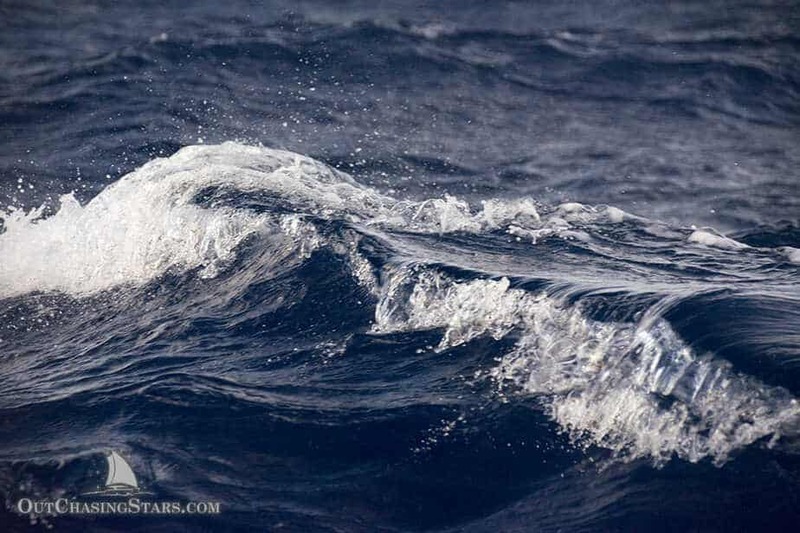 There’s not much to photograph out at sea, but playing with a fast shutter speed on the waves was amazing! It reminds me of blown glass. 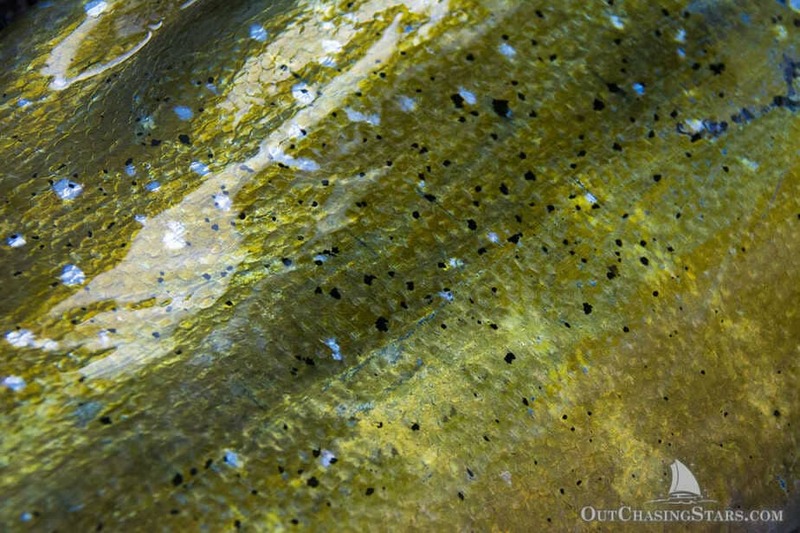 The glorious colors of a mahi-mahi. Reading about the fun you both have is inspiring. You should be back to Starry H. I look forward to reading about your reprovisioning and getting her back into the sea. Blessings. Thanks Wade! Glad you are enjoying our posts. We are glad to be back aboard Starry Horizons. 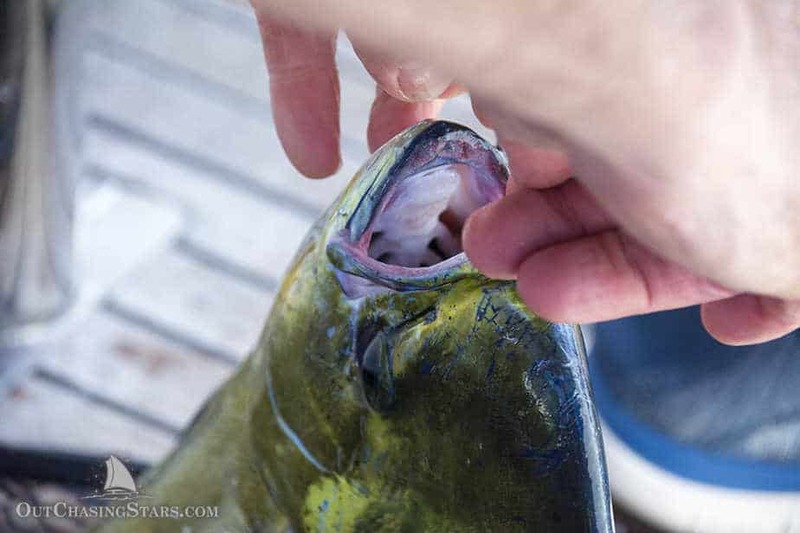 Marty the Mahi and friends do not stand a chance against the crew of Starry Horizons. And I disagree that your cooking of Marty was delicious in Fiji, particularly on Marty’s second meal. Glad you guys are eating well at sea. Make sure you get malasadas at Leonard’s while in Oahu! We will! We had malasadas at Punalu’u Bake Shop and Tex Drive In on the big island. They are yummy!! Wonder why we don’t have them on he mainland, I think they are better than doughnuts. I love reading about your passages–each one with different challenges. With San Francisco Bay displaying its different weather moods for you, its fun to imagine what it was like when the early explorers experienced when they risked entering a fog enshrouded passage inland?? Fog and SF just go hand in hand.. Anyway, very glad you arrived safely and what a headache to plan your flight back to SH. She (and you) will be glad to have you back on board and get underway again! Congrats on another interesting and wonderful new experience hiring out. Loved your descriptive narrative. Cruse on! This was quick! 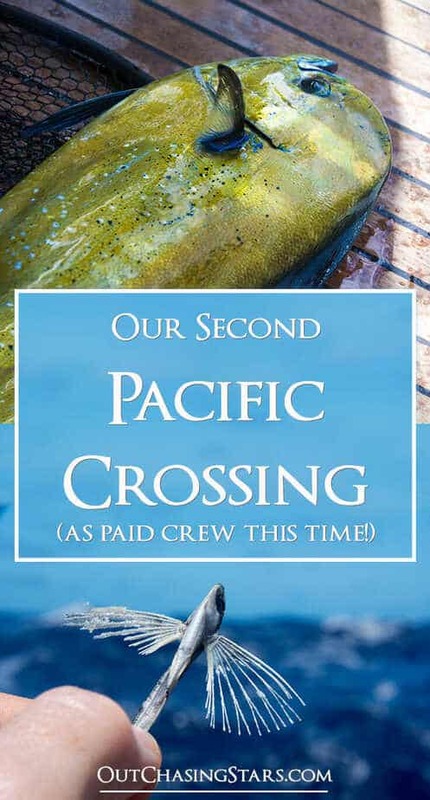 The vast majority of the world has not and will never sail across the Pacific – and you’ve done it twice! Truly marvelous. Thanks Jan! We feel pretty special. Cheers for another successful passage!